The 124 page ANAO report included some really interesting findings and recommendations; one in particular that might make our clients happy. The DCCEE are looking to introduce a materiality threshold into regulations to reduce the reporting burden in 2012/13. This would effectively allow reporters to exclude certain small emissions and energy sources that take a great deal of time and effort to calculate. Although incidental provisions are included in the Regulations to allow you to estimate small sources, a materiality threshold would allow them to be excluded completely. The question of “how do you know if it’s under thresholds unless you measure it anyway” remains, however your previous NGER reports should provide you the answers. As for liable emissions under the Clean Energy Act, these are generally not the small, incidental sources likely to be excluded by a materiality threshold – e.g. : liquid fuel use from small contractors, oils and greas etc. That being said, the regulators will need to include a safety net to address this. We are talking to DCCEE at the moment to find out some more information, if anyone would like to be involved in discussions please contact us. Our guess is that an amendment may be put forward with the Clean Energy Regulations currently being drafted. Another really interesting point was the high rate of adverse and qualified findings from the pilot audit program – where DCCEE sent in auditors to complete mandatory audits under the NGER Act. This was not really reported in the Fairfax article that concentrated on ‘17% of reports having significant errors.’ The 17% figure quoted in the Age came from the DCCEE verification, where an Officer conducts a (desktop) review of the final submitted report and look for basic errors (see page 85 of the ANAO report for the frequency and types of errors). The DCCEE verification is nowhere near as in-depth as the reasonable assurance audits (which will include site visits, interviews and other audit functions). The mandatory audits came back with four ‘qualified’ conclusions and four ‘adverse’ conclusions. In total, 47% of the reasonable assurance audits had either a qualified or adverse finding. Although the sample size is quite small, and the Department may have picked its targets, the results are poor. With the Clean Energy Act coming into force 1 July 2012, and the outcomes of the pilot audit program, the DCCEE will continue to ramp up its compliance and enforcement efforts, with mandatory audits remaining a central component. Our advice: consider (if you haven’t already) undergoing a voluntary audit for 2011/12 and reduce your risks. Late reporting has been recognised as an issue. At June 2011, 43 corporations were yet to lodge their 2009/10 report. The exact words from the ANAO report are “late reporting has been a challenge and will need to be addressed more firmly—particularly given the importance of greenhouse and energy data in underpinning the price on carbon”. We believe it won’t be long until a corporation is fined for not providing a report by October 31 under NGERs, and there will be very little tolerance under the Clean Energy Act. Our advice: start early, shorten your internal reporting process as much as you can and investigate carbon and energy reporting solutions to replace manual spreadsheets. Quarterly, monthly (and even daily) automated reports are much more efficient and accurate than an annual rush. 70% of those surveyed rated DCCEE support and guidance as ‘good’ to ‘very good’. 71.1% relied exclusively or primarily on manual spreadsheets. Only five corporations (2.8 per cent) reported that they had fully automated systems. Many reporting corporations are actively seeking automated data collection and reporting systems, while some are concerned about the costs. 47% used some form of verification. 35.9% are facing challenges in meeting record keeping requirements. An ANAO IT security audit of OSCAR, undertaken as part of the broader audit, identified significant security vulnerabilities. The subsequent report made forty specific recommendations to improve system security. Eight of these recommendations were classified as high priority. A (small) sample of corporations provided indicative estimates of their capital (22 corporations) and recurrent costs (68 corporations) of reporting. Capital costs range from $5000 to $3 million, and recurrent costs $1500 to $1.5 million. 47% registered no benefits, only compliance burden. 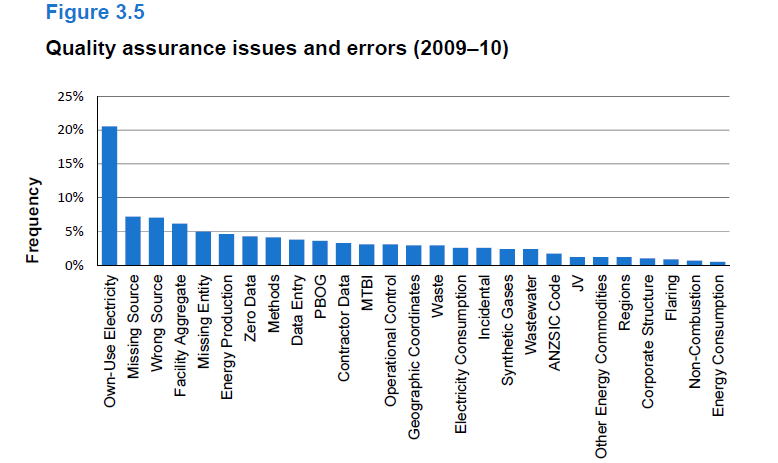 DCCEE has tabled the frequency of errors noted from their desktop quality assurance of reports – see Figure 3.5 (from the ANAO report) below. If you have any other topics you would like to hear about, or insights, please feel free to contact us.